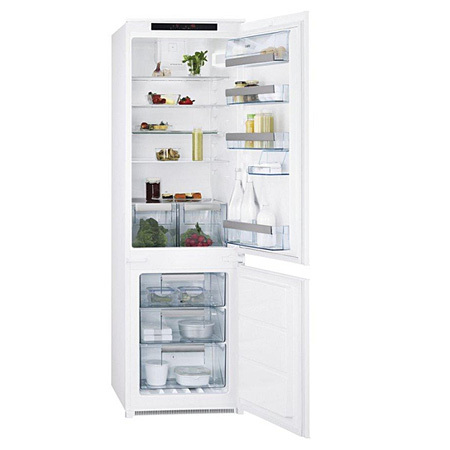 The AEG SCT71800S1 is a stylish white colour built-in fridge freezer with an efficient A+ energy rating.. The AEG SCT71800S1 Fridge Freezer has the frost free feature that maintains a constant flow of cold air through the appliance which prevents the build up of ice and frost on the inside of the freezer. With AEG SCT71800S1 Fridge Freezers spacious fridge compartment you can enjoy the flexibility of 192 litres of fresh food storage room, divided between five shelves. One of these is a flexi shelf, which can be reconfigured when you need to store especially tall or large items. Three of the other shelves are also adjustable to suit the different kinds of food youll store. You can neatly arrange jars and bottles on the four door balconies. Theres a wine rack and two egg racks as well. Cheese and butter are kept fresh in the dedicated dairy compartment, and two salad crispers help your salad and vegetables stay fresh and crunchy. The AEG SCT71800S1 Fridge Freezer has 78Litres of freezer capacity with three freezer drawers to help you divide different foodstuffs more effectively. Clear drawer fronts allow you to check stock levels without having to constantly open each compartment. Pay an initial 10% Deposit of £89.90. A £29 settlement fee is payable at the time of final payment. Settle the balance in 12 months interest free. Integrated 60/40 Slider Fridge Freezer w..